Now that the holidays are upon us, an abundance of food seems to be on hand at every turn, and it’s so important to try our best not to waste. We’ve partnered with Kroger for their Zero Hunger Zero Waste Initiative this holiday season to show you how to use the food you have so that less goes to waste. There is so much hunger in our communities, and a way my family gives back is simply by giving. We buy one food item for our fam and grab one for the food bank. This is a practice we utilize throughout the year, but it’s particularly important during the holidays. Preheat your oven to 350°F. Line a 9 by 13 baking dish with parchment paper. Slice rolls in half and tuck the bottom half close together in the baking dish. Cover roll bottoms with turkey. In a small bowl, combine melted butter, onion powder, parsley, and garlic powder. Spoon 1/2 butter mixture over turkey. Slice cheese into squares and lay over top of buttered turkey. 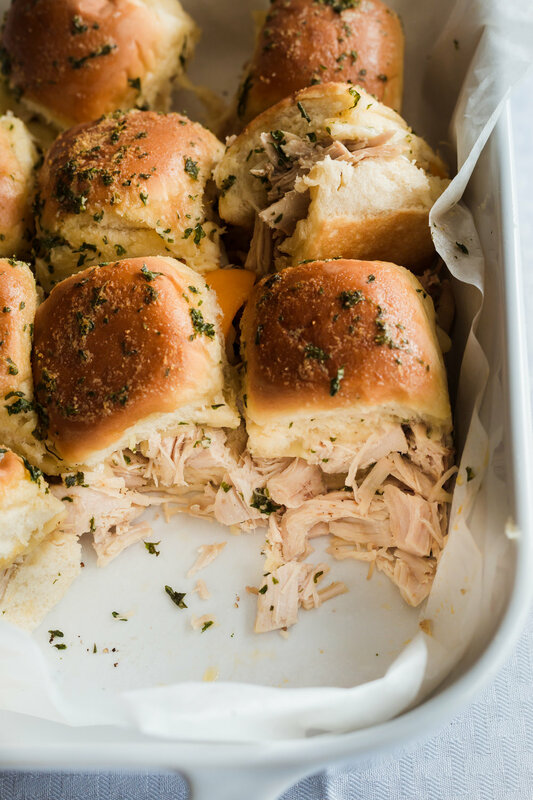 Place roll tops on turkey and cheese. Spoon last of butter onto roll tops and bake for 20 minutes or until tops are golden brown and cheese is melted.